Marion Dane Bauer is an award-winning author of more than one hundred books for young people, including the Newbery Honor Book On My Honor. Formerly on the faculty of the Vermont College of Fine Arts MFA program in Writing for Children and Young Adults, she now writes full-time. Marion Dane Bauer lives in St. Paul, Minnesota. Ekua Holmes is the illustrator of two previous picture books: Voice of Freedom: Fannie Lou Hamer, Spirit of the Civil Rights Movement by Carole Boston Weatherford, for which she won the John Steptoe New Talent Illustrator Award and a Caldecott Honor; and Out of Wonder: Poems Celebrating Poets by Kwame Alexander, Chris Colderley, and Marjory Wentworth, for which she received the 2018 Coretta Scott King Illustrator Award. Ekua Holmes lives in Boston. It's a stunning achievement to present to readers the factual events that created the birth of the universe, the planet Earth, and life on Earth with such an expressive, powerful creativity of words paired with illustrations so evocative of the awe and magic of the cosmos. But then the story goes one brilliant step further and gives the birth of a child the same beginning, the same sense of magic, the same miracle. Wow. In spare, supple verse, Newbery Honor author Bauer (Winter Dance) tells a big story...In a brilliant stroke of visual imagination, Caldecott Honor artist Holmes (Wonder: Poems Celebrating Poets) uses the swirls and waves of marbled paper to represent the ebb and flow of cosmic matter. Her spreads appear to move and shift on a grand scale, while Bauer suggests that, just possibly, the power of creation and the power of love are not so different. Poetic language and dazzling illustrations link the big bang to a child’s birth in this striking picture book...An inspiring match of writing and art. Perfect for one-on-one sharing. Holmes' dark and fiery illustrations capture the mood of the story about the void before the Big Bang and ensuing life that burst across galaxies. In the end, we are all the stuff of stars. 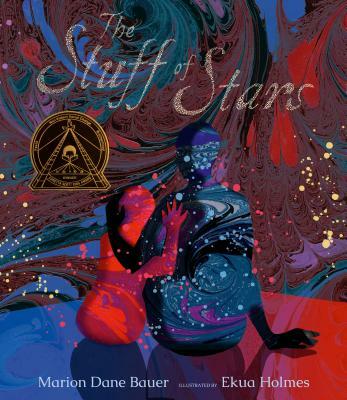 In this wondrous meditation on the origins of life, readers see matter expand and time and space blossom...The Stuff of Stars is out of this world. Where do we come from? Where do babies come from? The answer is awe-inspiring, energetic and powerful. Holmes’s deep blues and reds and sunlit, primordial skies celebrate the mysteries of the universe, the blue planet Earth and the birth of a child. This book appears to be part of a 2018 trend: Big Bang picture books that reduce down to the importance of the child reading this story. But only one of these books is as jaw-droppingly gorgeous as this one. I could stare, entranced, at the papers used in this book for hours and hours and hours.